Posted by Charmaine at 4:11 p.m.
November 4, 2008 at 8:43 a.m.
You're work leaves me breathless. It's so clean and perfect. You're what I aspire to be! Bravo! November 4, 2008 at 8:54 a.m.
November 4, 2008 at 9:02 a.m.
November 4, 2008 at 9:21 a.m. *GASP! * i LOVE rainbows STILL, and this is just absolutely wonderfully gorgeous. theres something to be said about colors when their in the right order in the spectrum, makes them all seem so much more beautiful! November 4, 2008 at 1:29 p.m.
November 5, 2008 at 12:45 a.m.
How beautiful! The rainbow looks so perfect, I'm sure your niece loved it! November 5, 2008 at 1:33 p.m.
November 5, 2008 at 2:16 p.m.
November 6, 2008 at 1:18 a.m. I came upon your blog while doing a search for Ganache Patisserie. I found it very interesting that you switched from a career in medicine to pastry. I have been in pastry for 5 years and now I am switching to medical radiography this January, though I wonder if I am making the right choice. I still love pastry, but carpal tunnel syndrome forced me to leave. Are you going to apply to work at the soon to be finished Shangri-la hotel or the new Fairmont Pacific Rim? November 10, 2008 at 12:32 a.m.
November 19, 2008 at 11:17 a.m.
My daughter is turning 5 next week and she is set on a rainbow cake. I was scanning through google images of rainbow cakes with her and she fell in love with yours! Would you mind posting further instructions on baking and assembly? I'm not looking for recipes, but rather how many 10" rounds you baked, how much batter was used, how you cut/divided the layers for the rainbow and the clouds, etc. Thanks for your rainbow inspiration! August 25, 2009 at 11:16 p.m.
Monica: I bake sheet cake and stack 10" rounds, alternating with filling, into a 10" ring, reaching about 4" height. Chill to firm up and then cut in half. Cut one of the halves into quarters. The intact half, when upright and placed on a narrow rectangular cake board, becomes the rainbow arc while the two quarters are the clouds. For internal support, I used a block of styrofoam between the two clouds on which the arc can rest (secure the cake board to the styrofoam). 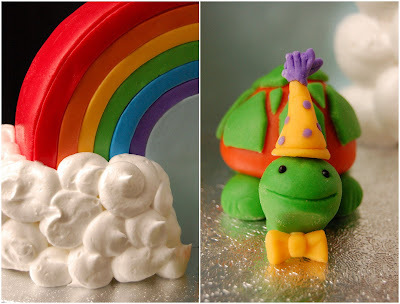 Mask everything in buttercream and cover in rainbow in fondant and the clouds in italian meringue. Goodluck! August 26, 2009 at 2:03 p.m.